Pictured Left to Right: Wendy Cleland-Hamnett, Acting Assistant Administrator of EPA’s Office of Chemical Safety and Pollution Prevention (OCSPP); Stephen Davison, President/CEO, Clean Control Corporation; David Widawsky, Director, Chemistry, Economics and Sustainable Strategies Division (OPPT, OCSPP). 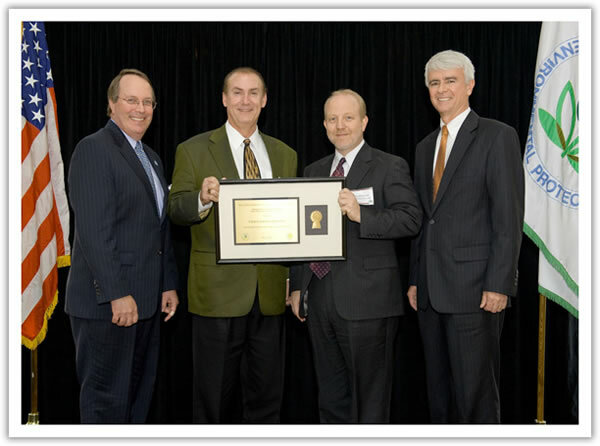 Clean Control Corporation recognized by the U.S. Environmental Protection Agency (EPA) along with 32 other award winners across 17 states and the District of Columbia for outstanding achievement in 2016 for the design, manufacture, and promotion of cleaning and other products that carry the Safer Choice label for use in households and facilities nationwide. Clean Control Corporation recognized by the U.S. EPA Safer Choice label program as an outstanding Safer Choice Formulator-Manufacturer for advancing the goal of chemical safety through exemplary participation in or promotion of Safer Choice, and continually driving innovation to make chemical products safer. The U.S. EPA Safer Choice label helps consumers easily find products that are safer for people and the environment. Clean Control Corporation completes Walmart, U.S. EPA, and CSPA ingredient disclosure initiative through public online disclosure. Biomonitoring California releases the recommendation of the Scientific Guidance Panel (SGP), adding two classes of aroma chemicals: synthetic polycyclic musks and tetramethyl acetyloctahydronaphthalenes. See the updated list of designated chemicals. Clean Control Corporation joins CSPA, the premier trade association representing the interests of companies engaged in the manufacture, formulation, distribution, and sale of familiar consumer products that help household and institutional customers create cleaner and healthier environments. A New Jersey appellate court affirms state agency’s denial of bids on contracts to supply laundry chemicals, holding the products contained prohibited ingredients. The case involved a company whose bid was rejected because its proposal would have supplied products containing alkylphenol ethoxylates, which the state would not accept. Maine designates the chemical class nonylphenol and nonylphenol ethoxylates as a priority chemical and requires manufacturers of household and commercial cleaning products, personal care products and home maintenance products that contain intentionally-added nonylphenol or nonylphenol ethoxylates to report on the use of the chemicals in those products and likelihood that children may be exposed from those uses. Copies of the rule at http://www.maine.gov/dep/safechem/rules.html. The USEPA issued and advance notice of proposed rulemaking for Testing of Certain Nonylphenol and Nonylphenol Ethoxylate Substances (Federal Register/Vol. 74, No. 115, p. 28654) for aquatic and sediment toxicity testing under TSCA section 4 for nonylphenol ethoxylates (NPE) and also requesting comment on gathering data under TSCA and through other means to facilitate the evaluation of industrial laundry worker exposure to NPEs. Clean Control Corporation was recognized as a Champion Partner—the highest level of recognition offered under the Environmental Protection Agency’s Safer Detergents Stewardship Initiative (SDSI). Pictured Left to Right: Charles Auer, Director of the EPA Office of Pollution Prevention and Toxics (OPPT); Stephen Davison, President/CEO, Clean Control Corporation; Cory Hammock, Vice President of Research & Development, Clean Control Corporation; Jim Gulliford, Assistant Administrator of the EPA Office of Prevention, Pesticides and Toxic Substances (OPPTS). A 12-year effort to eliminate the use of alkylphenol ethoxylate cumulated with Clean Control Corporation submitting an application for Champion Status under EPA SDSI recognition program. There are two categories for recognition under SDSI: Champion and Partner. Champion Status is the highest level of recognition offered under SDSI. Through SDSI, the EPA Design for the Environment (DfE) Program recognizes environmental leaders who voluntarily commit to the use of safer surfactants that break down quickly to non-polluting compounds and help protect aquatic life. Walmart announced it would work with suppliers and developed a timeline to replace nonylphenol ethoxylates (NPE), an ingredient in some cleaning products, with less harmful alternatives. Clean Control Corporation submitted comments at EPA hosted public stakeholder meeting to provide input on SDSI. A summary of the meeting is available online at www.regulations.gov, document number: EPA-HQ-OPPT-2006-0343-0002. Clean Control Corporation completed a 10 year continuous improvement strategy plan to eliminate the use of alkylphenol ethoxylate in 100% of all formulations, replaced by surfactant meeting DfE criterion. The USEPA issued Ambient Aquatic Life Water Quality Criteria – Nonylphenol (EPA-822-R-05-005). This document was a guideline for Agency decisions made by applying the Clean Water Act and EPA regulations on the basis of specific facts presented and scientific information then available. Clean Control Corporation began an association with the Design for the Environment (DfE) Program in an effort to obtain the most up-to-date information on components used in our cleaning formulations. Clean Control Corporation initiated a research project designed to eliminate the use of alkylphenol ethoxylate (APE) in formulations. By 1998, APE had been substituted in a significant portion of our formulations. However, technical and legal hurdles had to be overcome before the process could be completed. One challenge was FIFRA approval of alternate formulations for disinfectant and sanitizer formulations. Another challenge was bulk handling characteristics of alternative surfactants.